Summer is a great time to enjoy your favorite whiskey and the 4th of July is a perfect excuse for a party. Bring these two together and mix up a great whiskey cocktail for the celebration. From old-fashioned American originals to bright, modern creations, there's a simple whiskey drink waiting for you. This is an American classic. Good American whiskey, fresh lemon juice, and just a touch of sugar to round the flavors out make this a sure hit during a warm July evening. Even better, the Whiskey Sour can easily be batched. This allows you more time to enjoy the fireworks and your guests won't have to wait for another drink. True bourbon enthusiasts know that nothing hits the spot on a hot day like a real Mint Julep. It's cool, refreshing, and there's no great mystery to making it. Simple enough to mix, with just bourbon, mint, sugar and ice, the real key to this drink is selecting the right bourbon. The Kentucky Derby chooses Woodford Reserve for its juleps, but almost any bourbon will do just fine. Fans of Jack Daniels will accept nothing else. While many drink their beloved Jack neat or mixed with Coke, the Lynchburg Lemonade is perfect for a warm summer night. The presence of Jack Daniels seems to elevate the other ingredients. You don't have to use expensive mixers, just stick with JD and the rest of the drink seems to take care of itself. Moonshine is as American as apple pie and this cocktail has a certain pie-like quality. It's a ton of fun and something truly unique to add to the celebration. Grab your favorite 'shine and pick up one of that impressive American brandy your local craft distiller perfected. Add a little blueberry, a hint of almond, and mint straight out of the garden. This one's sure to please. The fruits of the summer take hold in a great twist on the classic Old-Fashioned. It fantastically easy and delightfully refreshing, what better way to enjoy your summer day? You'll want to scout out the ripest peaches and the best blackberries the markets have to offer. Muddle those up, top it with a great bourbon, then add a little sparkle. It's ideal for the barbecue. What could be more American than a little bacon? How about adding bacon to a robust bourbon like Knob Creek? While it's a little involved, it's worth the effort. Just make sure to plan ahead. Give yourself at least two days to get all those bacon juices into the whiskey. 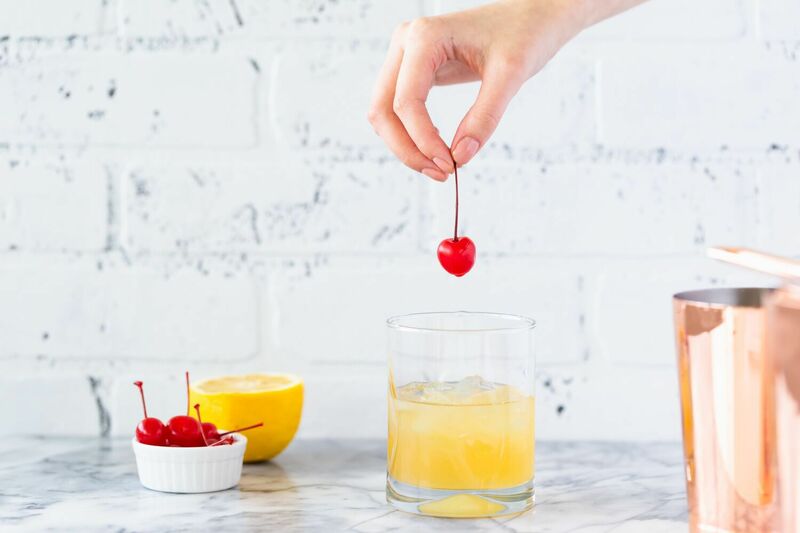 While you're waiting, mix up a custom cherry-cinnamon syrup and everything will be ready for your patriotic party. Oh so simple and a true summer delight. Few fruits scream summer like fresh strawberries and they're mighty fine against a bourbon background. Making this cocktail could not be easier. Prepare the puree with the ripest berries, then shake everything together. It's another ideal candidate for a pitcher drink so there will be plenty to share. Another true American classic, the Algonquin Cocktail is straight out of 1900s New York City. Rarely do we find pineapple and whiskey treated so well, but this one proves that it's a perfect match. The summery mix is simple and it has all that classic style we love. Better yet, the pineapple gives it a tropical flare. It's a perfect way to explore those great new American ryes. A southern delight, the Sweet Meat Cocktail is the peachiest bourbon cocktail you'll find. With just three ingredients, it's easy and everyone at the picnic is sure to be impressed. The key ingredient to this mix is the peach pecan water. You'll roast pecans in the oven, add them to boiling water with honey and peaches, and let the mix brew. Really, it's that simple.